Paulo serves as Client Development Officer for Geller Advisors. In this role, his primary focus is to develop and implement new business opportunities for the firm, while also providing support to the relationship management team in their efforts to ensure customer engagement and satisfaction. Paulo has extensive direct investment experience in both traditional and alternative asset classes and in managing a diverse array of clients, including high net worth individuals, institutional investors and sovereign wealth funds. Prior to joining Geller Advisors, Paulo spent four years at Union Bancaire Privee, helping consolidate their alternative investment offerings to the firm’s high net worth clients. 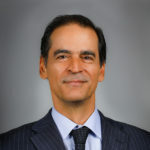 Paulo spent 15 years creating and growing investment platforms at Societe Generale Asset Management and Nexar Capital Group, which offered a broad range of hedge funds and other alternative products. Before that, he was a senior member of teams that created and managed the Emerging Markets Investment Banking groups at Bankers Trust Company and Donaldson, Lufkin & Jenrette. Paulo has a Masters of Science from Columbia University and earned a Bachelors Degree in Business Administration & Finance from UFMG in Brazil.